Welcomed by many people, Tetsu Nagayama (left) and his wife Tomiko cried with delight in the arrival lobby of Naha Airport on November 2. On November 2, a couple who were among the first group of emigrants from Okinawa to Bolivia in 1954 came home after 11 years. Ninety-one-year-old Tetsu Nagayama and eighty-eight-year-old Tomiko came back to Okinawa in 1972 before going back to Bolivia in 2002. 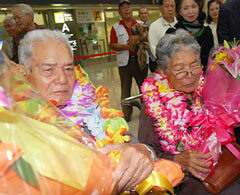 Their relatives and about 30 members of the Okinawa Bolivia Association warmly welcomed the couple at Naha Airport. When those waiting for the couple said, “Welcome home!” the husband and wife answered, “It’s good to be back.” Tetsu was so happy that he cried. After Tetsu led the first Okinawa group of immigrants to Bolivia in 1954 they created farms by reclaiming wilderness areas. Fifteen fellow immigrants went on to die of fevers caused by floods and droughts but they worked hard to develop agriculture by cultivating cassava, rice and soybeans. When he was back in Okinawa in 1979 Tetsu planted the seeds of South American plants such as floss silk trees sent from Bolivia and worked on a tree-planting campaign in Okinawa. The couple returned to Bolivia in 2002 but decided to come back to Okinawa once again because of their advancing age. Thanks to the support of Akemi Owan, professor at Okinawa Prefectural College of Nursing who visited Bolivia this September, the couple managed to make their trip back to Okinawa. The husband and wife will move into a nursing home in Tomigusuku. Tetsu said, “This happy feeling leaves me speechless.” They were thrilled to be reunited with their relatives.